You read that right. Your union is now offering a Free College Benefit to members and their families. The IAM is excited to announce the new free college benefit available to Machinists Union members and their families: a free associate’s degree from Eastern Gateway Community College. Having a college degree is more important than ever, but tuition costs just keep getting higher and higher. The IAM wants to help our Fighting Machinist families succeed without piling on thousands of dollars in student debt. That’s what makes this benefit of a free college education invaluable to IAM members and their families. Eastern Gateway Community College is a fully accredited college with degree programs in business management, accounting, criminal justice, associate of arts, and many more. Credits are transferable towards a four-year degree program. A college degree can be your pathway to new opportunities, greater responsibility, a better job and higher wages. Focused on working adults, this program is also designed to be flexible. Classes are online so they fit into your schedule. This is a unique opportunity — available only to union members, their families and retirees. You can find out more about the program here. You work hard, and the IAM wants to help. 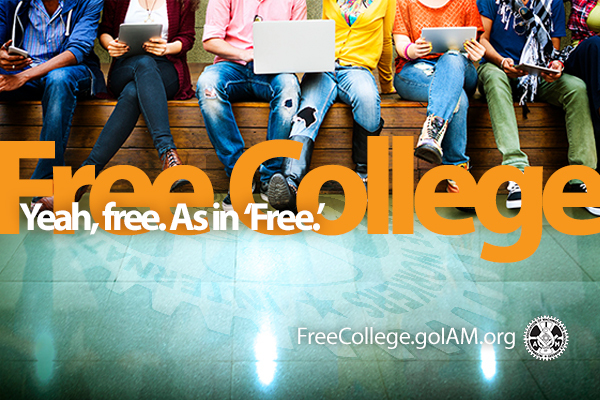 The free college benefit is one more way the IAM helps its members secure the opportunities and the respect they deserve. Take a look at this exciting new program and take advantage today to help grow your career.